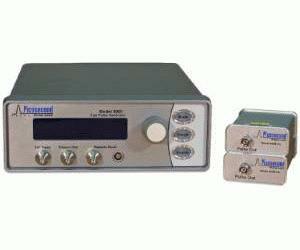 The Model 4005 calibration source produces an ultra-fast pulse with 9 ps falltime into an AC or DC coupled 50 ohm load. The pulse is generated in an external pulse head that is attached to the main unit via a coaxial cable. This allows the pulse head to be directly connected where it is needed, eliminating the risetime slowing effects of interconnecting coaxial cables. Pulse heads are interchangeable and available with fixed pulse amplitudes of 300 mV to 5V.